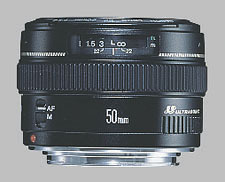 The Canon EF 50mm ƒ/1.4 USM has a relatively long history, first produced in 1993. We published our first review of this lens in March 2007, as part of Jim Tanner's comparative review of 50mm lenses. We've taken another look at the 50mm lens, with the release of our multi-sample Canon 50mm ƒ/1.4 lens test. The results here are from the best copy of that five-sample test. The 50mm ƒ/1.4 is made up of seven lens elements in six groups, designed to fit a frame of film (or nowadays, the full-frame digital sensor). It's compatible with Canon's cropped-frame cameras, and when mounted on such, produces an effective field-of-view of 80mm. The lens takes an optional ES-71 II lens hood, and 58mm filters. The lens is available new for approximately $350. As we've noted in our sample variation testing, the specific results in testing for sharpness depend somewhat on the ''generation'' of lens that you have, but there are some general consistencies. The first observation is that the lens isn't terrifically sharp when used wide open at ƒ/1.4. There is a small sweet spot of sharpness in the central region of the lens, in the area of 2 blur units, but this quickly tapers off to around 4-5 blur units through the majority of the frame. The corners become very problematic, though this is noticeable only on full-frame camera bodies, as a cropped-sensor body mercifully doesn't show the extreme corner softness, particularly on the right-hand side. Stopping down is essential to extract maximum sharpness from this lens, and to its credit, you don't need to stop down much to get there. At ƒ/2, there's already significant improvement, showing a much more 'even' sharpness profile that's quite sharp in the center (around 1.5 blur units, through much of the central region) and softening in the corners (upwards of 6+ BxU). By ƒ/2.8, corner softening has cleaned up dramatically, showing only around 2-3 blur units in the corners. At ƒ/4, the lens is very sharp indeed, and by ƒ/5.6-8 it's as sharp as sharp gets, showing 1 BxU across the frame. Diffraction limiting sets in at ƒ/11, showing only a slight reduction in sharpness (around 1.2 blur units) and by ƒ/22 it's up to two blur units across the frame. Performance is the same on the sub-frame 20D, minus some of the more glaring corner softness issues. Chromatic aberration is controlled very well by the lens, with no obvious CA problems at any aperture. Corner shading isn't much of a factor when the lens is mounted on the sub-frame 20D, with the most noteworthy impact felt at ƒ/1.4. At this aperture, the corners are just over 1/3EV darker than the center. As the lens is stopped down to ƒ/2, this light falloff disappears. On the full-frame 5D, it's a different story; at ƒ/1.4, the corners are well over 1.5 stops darker than the center. The corners lighten as the lens is stopped down: a full stop darker at ƒ/2, a half-stop darker at ƒ/2.8, and levelling off at a quarter-stop from ƒ/4 on. Distortion is relatively minor for this lens. On the sub-frame 20D, corner distortion is of the barrel variety, and shows a maximum of +0.25%. On the full-frame 5D, it's a bit more prominent, showing at just under +0.5% barrel distortion. The lens uses Canon's ultrasonic motor (USM) technology, and focuses very quickly and quietly as a result. A full focus from close to infinity takes less than a second. Autofocus results can be overridden at any time by just turning the focus ring. Finally, attached 58mm filters won't rotate during focus operations. Look elsewhere for macro: just 0.15x magnification, with a close-focusing distance of 50cm (around 18 inches). The EF 50mm ƒ/1.4 USM is a nicely built lens, small and light for the purpose: it's just 290 grams (10 oz), so why wouldn't you take it with you where ever you go? The weight savings are due to the plastic construction, completed with a matte black finish; the body mount is metal, and the 58mm filter threads are plastic. There's only one control surface on the lens: a selector switch to disengage autofocus (Canon abandoned aperture rings many years ago). There is a windowed distance scale, complete with a depth-of-field indicator tuned to the ƒ/22 aperture setting. There is no infrared index. The manual focusing ring is composed of a ribbed rubber, a half-inch wide. There's a generous amount of manual focusing distance, around 120 degrees, and it will focus slightly past infinity. There are soft stops at either end of the focusing spectrum, with the increased resistance alerting you that you've reached a limit. The optional lens hood is a circular-shaped bayonet style, which can reverse-mount for storage. Much less expensive than the 50mm ƒ/1.4, one of the perennial questions for Canon photographers has been whether the extra 2/3 of a stop is with the extra $250. The ƒ/1.8 lens is equally mediocre when used wide open, not providing consistently sharp images until it's stopped down to ƒ/2.8 (where the corners are still somewhat soft) and further to ƒ/4, where it provides good corner-to-corner sharpness. In this respect, it's quite similar to the ƒ/1.4 version of the lens, but with better performance for light falloff. Resistance to CA and distortion characteristics are similar between the two lenses. The difference? USM focusing is used in the ƒ/1.4 lens, and not in the ƒ/1.8. On the other end of the price spectrum, the 50mm ƒ/1.2 offers an extra third-of-a-stop of light-gathering ability as well as an even tighter depth-of-field. You also get much better results for sharpness - still not super crisp at ƒ/1.2, but much better than the Canon ƒ/1.4 when used wide open. CA is a bit more of a factor on the ƒ/1.2, as is light falloff - when used wide open, corner darkening is exceptionally high. Distortion is similar to the ƒ/1.4 version. As an L-class optic, its build quality is much higher. Used wide open, Sigma's 50mm fares better than the Canon ƒ/1.4, until about ƒ/4; at that point, the Canon carves out sharper images. Chromatic aberration performance is similar, the Sigma shows more corner darkening, and distortion is handled slightly better on the Sigma. If you don't need autofocus, the Zeiss 50mm ƒ/1.4 may be an attractive option, now that Carl Zeiss has begun offering its glass in the ZE (Canon EF) mount. We noted softness when used wide open at ƒ/1.4, but stopped down to ƒ/2.8, it was seriously sharp. CA is better controlled in the Canon, corner shading is better in the Zeiss, and distortion is about the same between the two. No longer in production, this highly-sought after lens occasionally shows up on the used market for $2,500-3,000. We haven't tested it and we're not likely to given its rarity. While it's not tack-sharp when used wide-open, the Canon EF 50mm ƒ/1.4 USM is still quite good, and stopped down to ƒ/4 image quality is excellent. At ƒ/8, it's as sharp as sharp gets. Used wide open however, the lens has some definite issues, and on full-frame, edge performance is remarkably poor. That said, it's unlikely that most users will notice or care about edge performance, and those that will are unlikely to use the lens wide open. There are a couple of reasons that the 50mm has been consistently popular: while it visually approximates the field of view seen by the human eye, it could also be argued that the price tag isn't terribly prohibitive, either. As cameras are capable of giving better and better quality images at higher and higher ISO ratings, the need for extremely wide apertures seems to be receding. However, for the creamy, out-of-focus background behind the subject, there's no digital solution, and in these scenarios, sometimes ƒ/2.8 just isn't wide enough. This is the standard lens (at least for full-frame / becomes moderate tele on APC-C). It is small and delicate. And with f/1.4, it is the cheapest "light capturing giant". 50 mm are suitable mainly for torso or full body shots. For pure head shots, it is not appropriate so much because it leads to slightly visible distortion (although this can be corrected in PP). The greater the distance to the subject, the smaller this problem becomes. But let's be honest, with the 50mm lenses, generations have photographed everything before the appearance of zoom lenses; and it is still the standard. With a fixed focal length, one is forced to think more about composition. Since you can not zoom easily, you have to move around the subject in the viewfinder. Primes are unbeatable in terms of light intensity, but you cannot use this in every picture. In principe, primes are weaker in terms of resolution , sharpness and chromatic aberrations at your maximum aperture. Therefore one must close the aperture if absolute quality is desired. From f/4 on this lens becomes even better. In extreme low light situations you can use the maximum aperture of f/1.4 because resolution , sharpness and chromatic aberrations are not that visible in such ambient anyways. It has a metal mount (as opposed to the 1.8 version that uses plastic) and eight aperture blades (important for nice round shapes in the bokeh) . Micro USM (no ring USM would be even faster) with FTM (full time manual, you can set the focus manually at any time) , which is not common in itself. In contrast to the 85mm lens , it is a bit more noisy and a little bit slower. However, with an aperture of f/1.4 this is a "light giant". The focus moves inside the "tube" of up to one centimeter. Luckily the front element does not move, so you can use polarizer flters easily. The Lens Hood ES- 71II is not included. You will find no better quality lens for the Canon in this price range. The only about 1 /3 stop faster than the 50mm f/1.2 that is almost four times more expensive. I've used all three 50mm lenses from Canon. The f/1.8 is just cheap and fun, no regrets, but not serious enough. The f/1.4 is good for enthousiast amateurs - amazing image quality and a decent lens! The f/1.2 is for those that can acually earn money with what they do, otherwise it's just too much money for the differene in image and bokeh quality. Nice looking lense at 1.4 aperture. That`s the good news. The bad news is you can`t get decent pictures wth it until stopped down to 4.0 and even then it lacks contrast. The colors are plain, boring and liveless and in combinatian with my 5d mk2 very unnatural looking, especially skin tones. Glad i sold all my canon stuff and bought something decent. Also this lens is of ancient design the only thing modern about it is it`s plastic construction an grinding autofocus. It seems to come fron the seventies and is optically hardly improved. Bokeh kinda busy. AF not as accurate. For the most part I have not been that interested in the 50mm focal length, since in the past I found it a somewhat boring. Many say 50mm is what the eyes “see” and thus it is a very intuitive and natural focal length for most people. I suppose this is true, and one of the reasons I have not been drawn to it since I like to offer a more interesting perspective with my photography. Canon’s 35mm 1.4 has been my go to lens when I only wanted to carry one prime. However I often found it too wide and not suitable for individual portraits. I was looking for a fast lens that I could carry around with me regardless of the situation… one which, if I had to choose just ONE lens (fast 2.0 or faster) and the 50mm seemed like the logical choice. It is good for portraits and wide enough to capture a scene if need be. It is a fast lens (1.4 or 1.2 aperture) so it is good for dark or dimly lit situations). Since I had a 30 day return option, I decided I would purchase both the Canon 50mm 1.4 and the Canon 50mm 1.2 L and see if I got to love this focal length and if so, which would I choose. This lens was acquired to be used with a 5Dmkii - both were purchased at almost close-out prices so I consider them to be bargains. Shooting mostly from f4-f8, the lens produces sharp images with very little distortion and nice colors. To minimize reflections and to protect the delicate focusing mechanism (the inner barrel protrudes when focused closer than infinity) for $21 the lens shade is a worthwhile accessory but should have been included with the lens. not the sharpest 50mm lens. Some says that the plastic 50/1.8 is even sharper than this one. I don't shoot test charts, but this lens is just fine with me. I get the fast-accurate AF, and it's still produce usable images wide open. Build quality is somewhat nice. It feels solid in my hand while it's made out of plactics mostly. It's not a leica, but you really got what you pay for. totally worth it. Is the best in price X weight X sharper equation. This is indeed a very nice portraitlens on my 400D. Use this lens on f2.5 and further up to f11 and your results will be nice and with good contrast. After this calibration (lens is paired with camera) my pictures are very sharp and nice. This calibration is a well known (at least at the servicecenter) issue and is carried out under warranty. I am very satisfied with this level of Canonservice. Used on an APS-C body (in my case 40D) this is a great portrait lens, and therefore it quickly became my favorite lens. 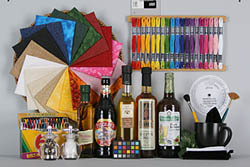 It has great pictorial quality, very nice colors, good contrast, but not at it's widest setting. Best used at f/2.8 and up. However, my sample's AF mechanism broke completely after a small bump and the cost of repair was almost as a new lens. Afterwards I did some reading and found out it used an older type of USM mechanism that is more prone to malfunction and very vulnerable. Size and weight. Sharp from f/2 thru f/11 (APS-C). Soft at f/1.4, no hood. Best value 50mm from Canon. Its a better investment vs the 1.8 and not much lost vs. the 1.2. You would only be getting the 1.2 IF you really really need the aperture, build quality and bokeh. I recommend the much cheaper Cannon 50mm F1.8. Although this F1.4 has a better construction quality, it is more than 3X more expensive at the same image quality. Even if this lens has a wide aperture of F1.4, I find it unusable at that setting - it becomes very soft especially on the right side to the point you feel the image is not focused properly. I think this lens is useful only from F2.8 beyond. I love this lens, its a great all arounder, portraits pop at the wide apertures, colors are well rendered and I get great feedback when presenting images from this lens to models/clients. I have even used it at a nightclub for event photography combined with a hotshow flash, colors in low light were amazing. Its just a really, really good lens. I did let it go because I got a zoom that covered the same range and wants the 100m F2, but I know I will get this lens again as money allows. I bought my copy used at a steep discount. The AF focus was not working, so full manual usage. I've read that the performance wide open is soft...I didn't really see that in my copy. It's very useable at f/1.4 but it does leap in sharpness from f/2 onwards. Sharp across the frame at f/2.8 on my 1D bodies. The color and contrast are very good for the money but I do wish it came with a larger focus ring and a lens hood. The AF mechanism is so flimsy that a drop from a short height is guaranteed to wreck it. There have been cases where the AF stops working for no apparent reason. I fixed my copy and now the AF works just fine. Other than the AF issue and small focus ring, the lens performs very well and is usually stuck to one of my bodies. I've use a variety of zooms, the 18-55, 17-85, 17-40L and decided to get the 50 f1.4 because the zoom lenses performance was not very good in terms of bokeh, sharpness and light gathering ability. I sold them all except the 17-40L which is just a fantastic lens for landscape and also very cheaply priced. I've had several 35mm cameras over the years and the 50mm has always been a workhorse for me and my most frequently used lens and this lens is no exception. I leave it on my 40D most of the time. I had to return my first copy to Adorama because the chromatic abberation was horrible, but my second copy was pristine and perfect. It was no hassel at all to do this, they have great service. I see people complaining about softness at 1.4 and all fast lenses are soft wide open. That's just the way it is. This lens is no exception but the distortion on my copy is very pleasant if a little "too" dreamy. But stop it down a bit, and it dials in very nicely to be very sharp at f2.0 and above. The bokeh is very nice and pleasant. I like the bokeh on this lens better than the Zeiss 50mm 1.4 which I've had the chance to use. On the other hand, the Zeiss is sharper across the frame. Overall I like this lens better, the autofocus works very well for me under reasonalbe conditions, ie not completely dark, and the focus mechanism is smooth and accurate enough to manual focus easily. The build quality is quite adequate and reasonable for the price and one reason I got this lens over the 50mm 1.8. It is lightyears ahead of that lens in build quality and finish. Overall, you can't go wrong with this lens and if you don't have a 50 in your arsenal, you really owe it to yourself to get one. Excellent lens, great image quality, fast focus and nice bokeh. Inexpensive. But don't try to use this lense below f2.2. This is probably one of the most popular primes ever sold. It is inexpensive, light and quite a sharp when stepped down a little. This lens is also about a quarter the price of the f/1.2. I have owned a copy of this lens since May of last year and it has opened up a whole new dimension of photography that just wouldn't not have been possible on a standard zoom. The DoF effect is very very shallow, in fact so shallow that I had trouble at the beginning locking focus on what I wanted. You will be using this lens in Manual focus mode much of the time simply because the AF won't always pick the correct thing to be in focus. This lens I use only for the interior and dimly lit with af/1.4 is really fantastic. The best quality you have to f / 4 to f / 8. I used this lens all over the world for me money/quality is 10. This is the only f/1.4 canon lens-economic. This is a nice lens overall. Yeah, it's soft @ f1.4, but my particular lens is not as bad as I expected from reading all the reviews. Stop it down to f4 or smaller and it is incredibly sharp, contrasty with very nice color. Great for shots of basketball in difficult lighting on a 40D. Focus ring has a little more play than I'd like, definitely not L quality, but if you need that, get the f1.2. Tested on a full frame body, the focus mechanism has become so sloppy that image quality is no longer good until well stopped down. Other reviewers say their copies are sharp from f/2, but my well worn copy is only sharp from f/8 to f/16. For the price, I think Canon should include a real ring-type ultrasonic motor, as the tiny gears are part of the reason this lens hasn't lasted through the years. Fast, sharp, light, good for portrait. It is a wonderful portrait lens. It is soft at f/1.4 but f/2 onward is sharp. I am glad that I own this lens. the size and weight feel nicely balanced on the 30D, not too front heavy and its got a nice focus ring for MF. The AF is very fast and pretty much always accurate. maybe some slight troubles in VERY dark places. while its not amazing, its still acceptable and i havent had any problems with it in the ~6 months ive had mine. as expected, its not amazing at 1.4, though for mine, at 1.6 its acceptable and ideal for street and portraits. stopped down further it can be too sharp for some detailed b/w images. other times its what you want, and it delivers. mine is definitley not as bad as slrgears test copy though. Excellent Image Quality. Great Value. Build Quality Slightly on Cheap Side. This is a GREAT value for a lens. I have purchased, used and eventually returned the 50mm f/1.2L from Canon after very disappointing results. This lens puts out great results. I don't see softness issues on my 1.6x body (20D). I concur with others in this group that SLR Gear should grab a hold of another copy and retest. Just as they should obtain another copy of the 50mm 1.2L - what a bad experience that was. Very sharp, excellent color and contrast. Large aperture. Fast auto-focus. Full time manual focus. The auto-focus accuracy could be better. DoesnÃ¢â¬â¢t provide distance information for E-TTL II flash systems. I agree with other users that although the technical quality of the reviews in this page is very high, in this particular case they must have got a bad copy because my lens at least is not that bad. Also the blur chart is clearly decentred which might indicate a bad copy. When compared to other reviews I have seen from photozone.de and photodo.com I find that they are more close to my experience with this lens. This lens has a good construction (much better than the MKII I had and better that the Nikkor 50mm f/1.4D I tested). In comparison the Canon 85mm f/1.8 has better construction. The auto-focus is fast and the full time manual focus is a very nice feature, although the focus accuracy could be a little better. Again in comparison to the Canon 85mm f/1.8, the auto-focus system is clearly worse (slower, noisier, less accurate). This lens absolutely shines in the sharpness, color and contrast department. It is clearly the best lens I have in this regard. The sharpness above f/3.5 is simply pixel splitting. Between f/1.4 and f/2.0 is acceptable if you hit focus and between 2.0 and 3.5 is very very good. I think that the only real problem with this lens is that it loses its magic in the crop sensor. I think that if I could go back I would buy the Canon 60mm f/2.8. If you want a sharp, large aperture, easy to handhold in low-light, normal field of view lens than you have to look some where else. P.S. : To SLRGear.com: please test another copy of this lens! I have used this lens from a firnd of mine with a 30D. At 1.4 it's horrible, very soft, i own a 1.8 MKII and never saw this one mine wide open. Things get better when you stop it down but only at 2.2 +/-. At the other apertures it's nice as crisp as it should be for a prime. Giving great results. The bokeh iisn't that great indeed it's a bit harsh so i would nor recommend this lens for portrait. (the 85mm 1.8 is much better, or 1.2 if you have the money). All in all a good prime but with a few quirks. I love this lens. It's worth every penny. It produces very sharp images, it focuses fast and precisely, and provides great background blur (bokeh) at large apertures. Granted, the bokeh might not be as stupendous as the 1.2 lenses, but it's still quite nice. The relatively quiet and fast AF motor is much more satisfying than on the f/1.8 lens. The lens does feature FTM-focusing, but because of the tighter DOFs, I usually find it necessary to switch to manual if I want to actually manually focus. While it's a pretty tight lens, there's a little bit of play in the focus ring, so that the initial movement doesn't change the focus when moving it in either direction. Perhaps this is a sign of age, but I'm thinking this is more a sign of quality. It also feels like you're pushing against the motor when you're manually focusing, something that I don't feel in the nicer L-lenses. Particularly for close-ups, you can't expect to get super-sharp pictures at apertures under f/2.8. I couldn't tell whether this was just general softness or because of overexposure, but if you must have definite sharpness, you do need to stay above 2.8. This is a very nice compact and light lens. Not quite as nice to use as my other Canon prime, the 85mm f/1.8 because unlike the 85 it doesn't have internal focusing, but very useful nevertheless. Optical quality is well up to making very saleable images (full frame), which is what counts. If you need a wide aperture lens that won't take up too much room in your bag, this could be the one. Anyway, construction of the lens is not bad.. nice focus ring.. should have been a classic lens if not for the 1.6x crop.. Now its much more of a portrait, low-light lens.. oh well..
USM is a good thing, focusing speed is superb although at very wide apertures I have to take a lot of shots because its not that accurate and the shallow depth of field is unforgiving..
All in all, a nice lens.. would have been a classic if not for the crop.. I just got this lens and have not tried it under a lot of conditions, but the pictures I have taken came out really nice. Using it with an auto portrait setting, the pictures were very clear. I could not be happier! I will continue to try it with different settings as I learn more and may post additional comments at that time. But for now, it seems to be a really nice lens. My pros and cons say it all. One other thing is that I wish Canon included the hood with it. Overall a nice lens and I'd buy it again if I had to. First of all, the build quality is markedly better than it's cheaper brother, the 50mm f/1.8. The manual focusing ring is actually much more usable now, and the addition of a distance scale & DOF marks are certainly welcome. Image quality-wise, wide-open aperture up to around f/2.0 should only be used a last resort since softness, vignetting & poor contrast are very noticeable at those apertures. Beyond f/2 up to around f/8, it is somewhat sharper & more contrasty than the f/1.8 version at the same aperture. It is best used around f/4-f/8. AF speed is noticeably faster & quieter compared to the f/1.8 version due to the use of micro-USM, although I noticed that AF accuracy seems to suffer in low-light. Even though it doesn't use a ring USM like the more expensive Canon lenses, manual focusing can still be used without switching out of AF. I find that to be a very useful feature. Overall, this normal lens is still highly recommended for its maximum aperture & sharpness (stopped-down). It's a better portrait lens than the f/1.8 version since it gives a nicer-looking background blur quality due to the use of an 8-bladed aperture. I just wish that it is cheaper, maybe priced at just around 2-3x more than the f/1.8 version. Nice lense on the 20D the lens is a little long for being a normal lense, but for portraits it fits nicely. I find the lense wery sharp from f/2.8, and it is sharp at f/2.0, but wide open it is not sharp. I use it sometimes at this aperture anyway if the light is dim but I try to keep to f/2.0 most of the time. At f/1.4 the sharpness is adequate for a good looking letter size print, but at 2.8 you can go much bigger. The build quality is ok, but not great, much better than the 1.8 version however. Compared to my EF 50/1.8, I found this lens to have a better construction quality (not very hard), and a slightly better image quality (with the same aperture). However, at full aperture it is worse than the cheap 50/1.8 but the speed gain might be useful, so why not. I wish it had a "true" ring-type USM motor like the EF85/1.8. I didn't think it was worth the update from my EF50/1.8, but that doesn't mean it's not better. Anyway, it's a great lens, but avoid full aperture shots unless you really need the speed of f/1.4. Decent lens, but below f2 there's a wierd halo around everything. Focusing is sometimes great, and sometimes horrible. On APS-C DSLR the lens is very useful as a portrait lens. Wide open softness can be used as an "soft" effect for portraits. Anyway right from the f2.0 it became very sharp (still not as sharp as 100/2.8 macro). Can be used as an all-purpose lens and for low-light conditions on FF body. A good lens with decent sharpness and high speed. Its not terribly sharp at 1.4 but picks up nicely by f 2. The focusing is a little noisy but fast enough. The construction is average and manual focusing is abit coarse. A good value but not a good a value as "nifty". The 1.8 IQ is softer, its the construction quality is worst, as it's the AF, and only marginally cheaper. The 1.2 is much more expensive, only a little bit faster and better built. The AF speed is the same, as it's the vigneting. The 2.8 macro is not so fast ... not the same league. This lens does not give information about the distance to the camera, so the E-TTL II flash doesn't work. The f1.4 aperture can be very tricky for composition, you have a really tight DOF and a soft image ... if you can live with that, this is your lens!!! On a Canon 20D, this is a great indoor, low light portrait lens. The background blur is very nice and you don't need much light to take pictures of a moving child without a flash. The blur helps remove some of the clutter that is omnipresent with a child at play. Although I do not use this lens often (my Tamron 28-75 spends much more time on the camera), I am always very pleased with the handling and very nice quality of the images from this lens. The blurry backgrounds at F1.4 can be very nice. Keep in mind that the focal depth at F1.4 is so narrow that if the eyes are in focus, the ears will be a bit blurred. It is critical to get the focus exactly on the point you want to have in focus. (The autofocus works well, so this is usually not difficult to do.) The effect of this wide open, short depth of focus portrait can be quite nice and is unavailable without this wide an aperature. Stopped down a bit, the lens is sharp and maintains nice out of focus background patterns (bokeh). I have found that pictures taken with this lens have a nice feel to them. I like this lens when used for portrait shots. The softness actually helps somewhat in this kind of situations. With a 1.4 aperture, it is a lot more versatile than using the 17-85mm IS Zoom lens. The 8-bladed aperture helps the bokeh compared to the Canon 1.8 II lens. Focus speeds seems variable. Sometimes the lens "hunts" a bit. The lens build quality is nothing to write home about, but it does seem a bit better than the stock 18-55mm zoom kit lens. Stopping down to 2.0 or higher improves sharpness. The lens is quite compact and is a useful prime lens. The odd thing is that when taking pictures of Christmas lights, there are ghost lights on one side of the image. I have this lens for some time and happy with sharpness in mid F# area 2.8 - 8.0. However, I thought of better performance at F 1.4. Overall is a good Lens and could be even better with improved built quality -seal, focusing. Overall the lens gives excellent results : very sharp pictures with nice contrast and colors all over the frame (on crop body at least). I tried this lens, while hesitating with the EF-S 60 macro 2.8, and the image quality at 1.4 finally made the difference for me and I bought the 60mm. I was surprised when I saw the DXO results for the sharpness of this lens at f1.4 and went back and reviewed my own test photos. I think that I may have a slightly better copy than the one tested above. Yes, there is clearly some softness at f1.4 but it is very close in sharpness to my 24-70L at f2.8. On the other hand, it is significantly less sharp than my 135L at f2.0. when my copy of the 50mm f1.4 is stopped down to f2.8 the image quality is excellent But, for my photography, this is a lens of limited usefulness. I only use it in low light situations. Between f/4 and f/8 this is one of the sharpest lens I've ever seen. Performances at f/1.4 are not stellar: with full frame SLR you'll find a lot of vignetting; especially at corners, you can frequently notice poor contrast and narrow resolving power. Quite often, this is not an issue, because you'll probably use this aperture for portrait work or special effects, when you can push the great bokeh of this lens at its best. Anyhow, the test results you can find in this site doesn't match my field experience, because blur at full aperture is a real disaster here, and seems to show some decentering effect (which usually suggest a defective lens). According to many other lab tests, my field experience shows a usable lens, even at f/1,4. Distortion is visible only with close subjects: it looks more like coma than geometric distortion. Contra light performances are really good; color balance is always neutral. The build quality of this lens is decent, but a little disappointing, especially when compared with its optical performances. It provides a micro-USM AF drive including full-time manual override in one-shot AF mode: it proved to be quite fast and nearly silent, but not as practical as the more usual ring-type USM. All-in-all this is a great lens, highly recommended for both full frame or APS-C DSLRs. Another winner from Canon. I used to use this as a normal lens on a Canon EOS 3. Now it is an excellent choice for a close portrait lens, much like the use I had for the 85mm f/1.8. I have gotten great photos with the lens and am very comfortable relying on it. Bokeh is great, sharpness, stopped down even one stop is excellent. At f/1.4, results can still be quite good, just remember depth of field is shallow. Hey for the price it's pretty good! Soft wide open on my copy. A bit slow to focus, but it is light weight and overall its really a pretty good lens. I enjoy it and produce some good low light images with it, but I have high hopes for the 1.2. A little soft wide open. AF not very fast. I wish Canon would consider an update with Ring USM. I was somewhat disappointed by the results of this lens. It's very soft at 1.4, even for portraits. It gets very sharp by f2.8-4, but the whole point of buying a 1.4 lens is to use it at 1.4. 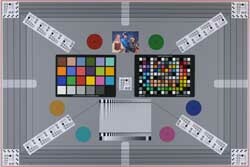 In addition to the softness, there is also a glowing or soft-focus look to the pictures taken at the largest apertures. The bokeh is decent though, so if you need a 50mm, this is probably the one to get. Just don't expect much resolution at the max apertures. 1.4, Very light, Extemely Sharp, Very Good Wide open. USM could use an update, Focus ring could use more dampening. It seems there might be Quality Control issues with this lens. I find mine to be quite sharp wide open. Sharper at 1.4 than my 100mm is wide open at 2.8. It's my Sharpest lens at any aperture. I really don't like the Field of View the 50mm lens gives my on my 1.6 crop, but I can't bring myself to sell this lens because it's so sharp. The USM could really be faster. There is a little noise, but nothing to worry about. The Focus ring isn't suitable for a 1.4 lens. AF accuracy can be a little sketchy on a 20D in low light or on areas with less than high contrast. If you like the 50mm length and sharpness is your highest priority this lens highly recommended. I bought this lens for its low light capability but was staggered by its softness at f1.4. Maybe my camera can't get the focus point spot on which adds to the problem. Not as slick as modern lenses but apart from at f1.4 I have found this an exellent lens and enjoy using it. For a 1.6x DSLR, this is probably the best (affordable) portrait lens. Shooting wide open gives great bokeh - yo just have to double check that what you are focussing on is actually in focus because of uper shalloe DOF when wide open. AF speed is also great and in my copy, spot on. Lens is also lightweight and well built (it's no "L", but yo already knew that). I like this lens but it is a mixed bag. It is a little soft wide open, but my copy is very sharp by f2. It does not focus as quickly as the 28 f1.8, and wide open it vignettes pretty dramatically on the 5D. But when you need f1.4 (like when working in a church) you need f1.4 and it is there. When you close down to f2.8 or f4, it is absolutely great, very sharp and the vignetting is gone. If or when Canon revises this lens, I would like to see 1) internal and faster focusing, 2) closer focusing and 3) improved performance wide open. Despite its flaws, I would still recommend this lens to someone who needs a fast normal lens. Fast f1.4 aperture, Small and lightweight, USM (albeit micro and not ring), FTM, Very good sharpness by f2. Construction could be better, Ring USM would be nice, 18" MFD. Useable wide open but finds its sweet spot around f4.0-f5.6. Very good to excellent by f2.8 though. While the construction is better than its plastic sibling (i.e., "thrifty fifty"), it's no L-grade by any means. AF is fairly quick and silent, but the lens does extend/retract when focusing. Considering it's an f1.4 prime with very good optics, I recommend this lens especially at its price-point. One of my favorite lenses, it's fast, light, and superb image quality. Slightly soft at 1.4 and super sharp from 2.0 on. The focus ring is loose and focus is not as fast as L primes. Build quality is very good, but I expected better. I haven't found a problem at F1.4, but the depth of field is so narrow, I tend to work with this lens at F2.8 or F3.4. The build quality is very good but I expected excellent. It's a good lens, but the F1.8 version is much cheaper. SLR Gear's review confirms my observations, and the user reviews found elsewhere. It is exceedingly soft at f1.4, passable at 1.8 and good at 2.0. When I tested my first copy, I thought it had to be a particularly poor copy, and exchanged the lens. The blur sometimes emphasizes the wrong part of the image, as the sharpest parts of the image might not be the intended focal point (e.g., the mouth instead of the eye). My second copy seemed slightly better, though it may actually be because the distribution of blur may be different, and not quite as bad at the center of the frame. Since I intended to use the lens for low light, no flash situations, I am somewhat disappointed that it has to be stopped down for usable images. However, it is sharper and faster than my Canon 17-85 mm, so I intend to keep it until I can afford an "L" series standard zoom replacement. Although the image quality is excellent stopped down, I don't think the lens' deserves more than a "good" rating since for many photographers, the main attraction of the lens is its speed, and its "poor" image quality wide open should be more heavily weighted in the final evaluation. On this one, the DxO test results do jibe with my experience. Yes, it is noticeably "gauzy" wide-open, and especially strongly backlit subjects acquire a translucent kind of look; what looks like axial CA also tends to spill over high contrast edges. And yes, it's very sharp stopped-down. Wide-open, it's also somewhat prone to veiling flare; with big bright expanses in or just outside the frame, contrast drops pretty dramatically. This lens benefits greatly from a hood -- too bad it's not bundled. However, one thing that the tests don't catch is that the wide-open look isn't, actually, ugly. In my experience, it works rather well for portraits -- sort of like a very mild soft-focus effect, which smooths out little skin imperfections and such. For the other wide-open mission, available-light situational shooting, the performance is more than adequate. And yep, stopped-down it's impeccable; very very sharp with a very clean transition to out-of-focus. For sharp corners on full-frame, you need to go down to between f/5.6 and f/8.0; on APS-C, it gives an even frame at all apertures (and makes for a very nice portrait lens). Details aside, this lens has "it" optically, whatever "it" is. The results just look... nice. Sort of vaguely "retro." I like it a lot. The lens deserves better build, though. The micro USM AF motor with the slip-clutch hacked in to permit full-time manual feels rougher and "stepped" compared to ring USM motors. Overall the lens has a distinctly plasticky and down-market feel to it. I would expect better for the price (and the optics). I wish Canon made a really good f/1.4 normal -- with wide-open sharpness to L standards and build at least as good as on the 85/1.8 USM, but without the huge bulk and price tag usually associated with L's. But there you are, currently this is the best 50 Canon offers, and even though it's not exactly the brightest jewel in Canon's crown, it's a long shot from being a let-down. But it really ought to be a bigger step up than it is from the dirt cheap and shoddily-built but optically very respectable 50/1.8.